Grosvenor Gallery is proud to present an exhibition of paintings by some of the foremost Arab artists of the late twentieth century. We have collected the work of pioneering artists from Iraq and Syria to attempt to display the inception and development of the modern art movement in these countries, both equally rich in history and heritage. We are especially fortunate to display two rare and important paintings from the first group exhibition of Arab art to tour the West, as part of Carerras Craven 'A', Arab Art Exhibition in 1967. 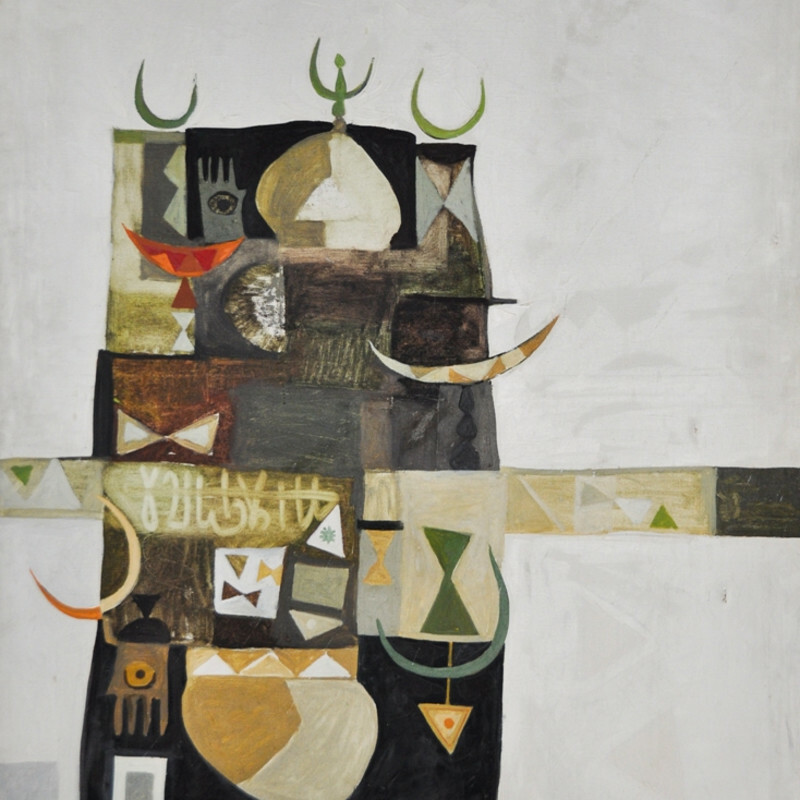 These works; Dia Azzawi's Islamic Compositions, and Hashim Samarji's Composition of Sights, have not been displayed publically since the late 1960s and were heavily complimented by the organisers of the exhibition, with Samarji's work winning first prize in the Iraqi section of the show. This exhibition at the Grosvenor Gallery is one such fresh occasion. This first exhibition titled " Modern Arab Masters " merits serious consideration in-spite of its slightly exaggerated title. But that enthusiasm is pardonable, for it is a serious modest first effort to put together a sound collection of modern Arab artworks marking the 60's and 70's, and including some rarities such as the Issam el-Said work. In their early periods of work, Arab artists were more recognized in their own countries, and in the case of the late Issam el-Said, he was not even recognized outside the expatriate Iraqi community in London until he was shown in Kuwait at the pioneering Ghazi Sultan Gallery that had taken leadership in showing Arab art in the early sixties, later to be followed by Gallery One in Beirut in the mid sixties, that showed remarkable works by Arab artist including Ismail Fattah, Kathim Haidar, Munira al-Kazi, Shebrin and many others, to be followed by other other galleries to make Beirut the undisputable Mecca of Arab art. While academic and ecole de Paris in style in what he shows here, the work of Jameel Hammoudi merits historical interest, as he later became the unsung pioneer in demonstrating the influence of Arabic calligraphy in his abstract compositions. The 1966 canvas of Faiq Hassan and the 1960 gouache by Hafiz Droubi can safely be labeled master works of that period. It illustrates Faiq Hassan's departure from his early French influenced abstract work, to a modern visual narrative that employs his local cultural references as vocabulary. Hafiz Droubi, on the other hand, remained a loyal to his British education and the influences post cubism in European art. Nouri al-Raoui's delicate and romantic nostalgia for his disappearing Euphrates village Rawa, renders his favorite subject with transparencies and harmony best known for this artist, in contrast to Mudarres's bold and passionate reflections on his pastoral subjects. Finally, the delicate jewel of Suad al-Attar, from her early years in Baghdad, while demonstrating influences of Assyrian relief compositions, does not fail to communicate the delicate and dreamy atmosphere of a city awakening with optimism that she lives to lament its tragic disappearance.. While this is a first for the Grosvenor Gallery, it is hoped that next shows would reach beyond the Mesopotamian basin to the shores of the Mediterranean in Lebanon for classics like Abboud, Helen Khal, Farid Awad etc., or to the Nile area in Egypt and Sudan to explore pioneering masters such as Ramses Younan; and the atlas region for works of north African masters such as Qassimi and Cherqaoui. I gives me personal pleasure to see professional galleries such as this exploring Arab modern artistic heritage.